The performance features the participation of conductor Tran Vuong Thach, piano soloist Tamura Hibiki (Japan) and the Vietnam National Symphony Orchestra. The exhibition features works by two Vietnamese artists Le Thi Minh Tam and Nguyen Manh Hung. Two artists, two different genders, two ages, two different artistic styles, two different journeys of creating artwork… but their paintings share a common: “Yin” matter (from Yin-Yang concepts) – it might be the afterlife world, but could also be the inner spiritual/emotional realm or character/the spirit located inside everyone. 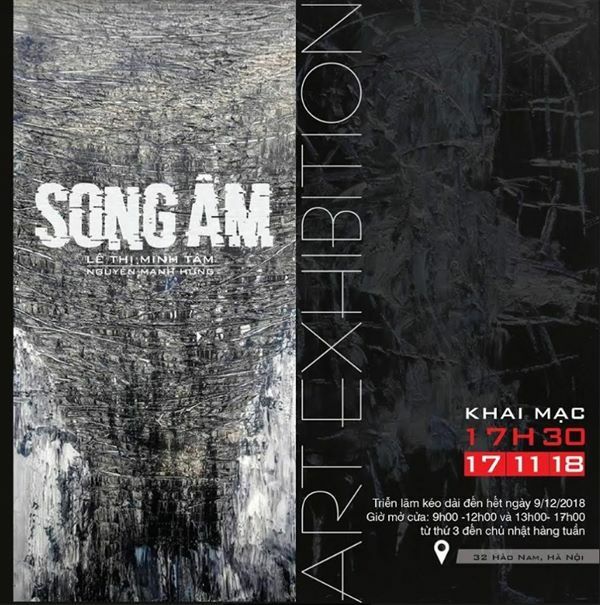 The exhibition showcases artworks by 14 Vietnamese and international artists after completing the project 'Month of Art Practice' (MAP 2018). Disciplines are varied from painting, sculpture, photo and videography, multimedia and performance, installation and site-specific art. This is the first Chamber Music Concert in Vietnam performed by the Spanish pianist Hilario Segovia. The event also features the participation of bassoonist Nguyen Bao Anh and flute artist Matthew Wu from Hong Kong (China). This is a solo exhibition by Nguyen Minh Nam exploring the continuous evolution of the roles of women in Vietnamese society.